IT TAKES A LOT of work and planning to get six Blue Angels high up in the sky. Just ask pilots Lt. Daniel McShane, with the Navy, and Maj. Nate Miller, with the Marines, who spent the past two days meeting, planning and coordinating countless details to pull off a two-day show in October. 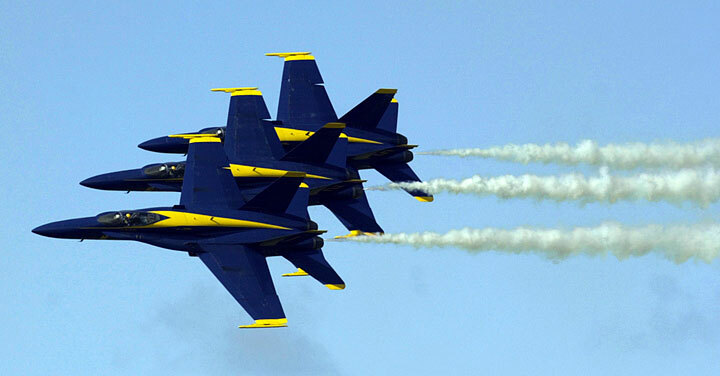 The famed U.S. Navy Blue Angels are scheduled to participate in two public air shows at Marine Corps Base Hawaii in Kaneohe Bay on Oct. 13 and 14. To make it happen, they need nine FA-18 Hornets -- three of them are spares -- and a C-130 plane, nicknamed "Fat Albert." And of course, 70,000 gallons of jet fuel and 1,650 gallons of biodegradable smoke oil to throw into the exhaust to create the showy trails of white smoke. The Angels are performing to show their appreciation to a state that heavily supports the military, McShane said. But for the Blue Angels, Hawaii provides special challenges and opportunities. McShane attributes their long absence to the difficulty of coordinating efforts here, since Hawaii is a staging point for many military operations. But Hawaii also provides for an exciting backdrop, far different from open expanses. "It's way cool," because the topography allows the aviators to perform interesting maneuvers, Miller said. "From a showmanship's perspective, pilots can get behind the hills, then sneak up" and reappear. "It's a lot of fun from a pilot's perspective." And McShane joked, "We get to do sightseeing, too." When they're not coordinating events, Miller and McShane narrate them. The first of 35 show sites is El Centro, Calif., where the team is training until a March 10 show. Although the two pilots don't perform, they've ridden in the back seats. "It's awesome. It's a rush," Miller said. It requires full concentration, he said. "That close, that speed, all that precision." McShane said, "It's like driving a car upside down at 450 mph, pulling 8 1/2 Gs." But their service as Blue Angels is temporary. 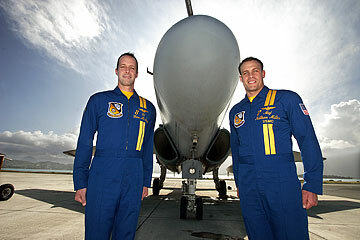 They hang up their royal blue-and-gold flight suits after two to three years and return to operational duties. But while they do, the men say it's an honor to serve as Blue Angels. "We're representing all the men and women flying the gray planes and sailing the gray ships," said McShane, who celebrated his eighth anniversary in the Navy yesterday. » Before the 2004 Kaneohe Bay performance of the Navy's Blue Angels at Kaneohe Bay, their last Hawaii show was in 1995 at Barbers Point Naval Air Station, not 23 years ago as stated in a story Wednesday on Page A3. Their last performance at Kaneohe Bay was in 1982.